Before Twitter and the U.S. Open was a flutter this afternoon with the news of Venus Williams withdrawing due to the diagnosis of the autoimmune disease- Sjogren's Syndrome, the U.S. Tennis Association was focused on another health related issue. Today the press release went out that tennis legend Billie Jean King was joining the Arthritis Foundation, the Ad Council, and the US Tennis Association (USTA) to launch a public service campaign against arthritis (the leading cause of disability in America). The ads, launched at the U.S. Open today, feature King (who has osteoarthritis- OA) and highlight the power of movement and exercise as "weapons" in the fight against arthritis. King tells viewers "tennis is my weapon" against arthritis. The ad then asks viewers, "what is your weapon against arthritis?" and directs them to the campaign's website in order to find out: Fight Arthritis Pain. On first view, I was not terribly impressed. The brief ad (33 seconds) does not tell you very much (e.g., King says tennis is her "weapon" but nothing is said about the benefits of movement). The goal of the ad simply appears to be motivating viewers to visit the website for additional information. The other thing that is not clear in the ad (but clarified in the press release and website) is that this campaign is targeting OA specifically. While OA is the most common type of arthritis, it is not the only type. For example, in contrast to OA which breaks down cartilage, rheumatoid arthritis (RA) (a chronic autoimmune disease) causes inflammation of the lining of the joints. Would the exercise recommendations be the same no matter what type of arthritis? I would say that distinction is unclear for viewers. However, I did feel better when I read the press release and saw that these ads were tested in focus groups by the Ad Council. Testing your images and messages with your target population is incredibly important. It is reported that participants felt that the concept of "having a weapon" against arthritis was powerful and motivating. That is good news considering formative research by the Ad Council found that only 16% of OA sufferers surveyed felt "very confident" that they could manage their pain. Therefore, if an ad can make viewers feel empowered and confident- that is a good thing. The press release did not describe the demographics of the focus group participants, but I am assuming they were similar to those originally surveyed (adults age 55+ with OA). If so, it would mean that Billie Jean King was an appropriate "Champion" for the cause and someone that audience admired, having watched her in the 1960s-1970s, her prime competitive years. 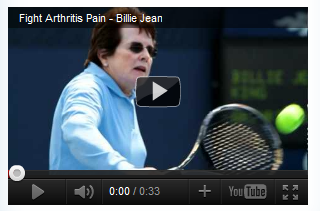 However, I wonder if she would be the best choice for ads targeting arthritis sufferers in a younger demographic? After all, different types of arthritis can affect people of all ages. Again, this is another reason that I would have wanted to see a clearer definition of the audience for these ads. If we are focused on older adults with OA, then it is a great choice. If we are focused on people of all ages with all types of arthritis, then maybe not. Overall, I give this campaign a "B". The impetus of the campaign is good in that it is based on research...research that shows that arthritis suffers are too sedentary and do not feel like they have control over their pain management. The campaign aims to address these barriers by empowering viewers with a "champion" who they admire and can model. The campaign also links them to a website with all the information they need about the benefits of exercise for arthritis. However, the execution of this campaign is not as strong as its foundation. It would have benefited from a more clearly defined audience and message.